The ADE7752 is a high accuracy polyphase electrical energy measurement IC. 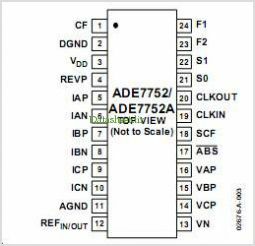 The ADE7752A is a pin-to-pin compatible low power version of ADE7752. The functions of ADE7752 and ADE7752A are the same. Both products are referred to in the text of this data sheet as ADE7752. The part specifications surpass the accuracy requirements as quoted in the IEC62053-2x standard. The only Analog circuitry used in the ADE7752 is in the Analog-to-digital converters (ADCs) and reference circuit. All other signal processing (such as multi- plication, filtering, and summation) is carried out in the digital domain. This approach provides superior stability and accuracy over extremes in environmental conditions and over time. The ADE7752 supplies average real power information on the low frequency outputs, F1 and F2. These Logic outputs may be used to directly drive an electromechanical Counter or to Interface with an MCU. The CF Logic output gives instanta- neous real power information. This output is intended to be used for calibration purposes. By Analog Devices, Inc. This is one package pinout of ADE7752A,If you need more pinouts please download ADE7752A's pdf datasheet. 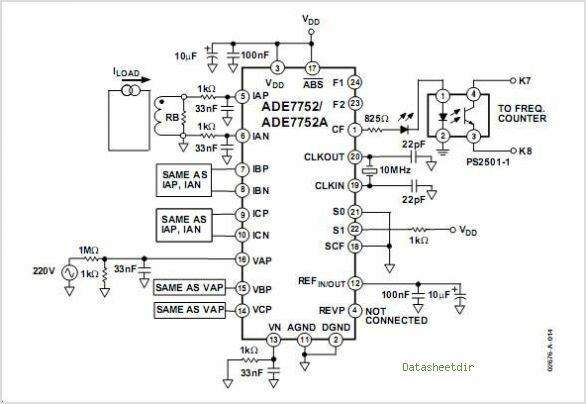 This is one application circuit of ADE7752A,If you need more circuits,please download ADE7752A's pdf datasheet.